SEVILLE: Sevilla coach Unai Emery has admitted his side have no chance of winning the Champions League and says their priority is to perform well in La Liga so they can secure a lucrative berth in the competition again for next season. As the Europa League holders prepare to host Manchester City today, Emery said Sevilla must focus on improving their domestic form after they suffered another setback in Saturday’s 2-1 defeat at Villarreal which left them in ninth after 10 matches. The Andalusian club qualified for the Champions League after winning a second consecutive Europa League crown last term and are third in Group D on three points after going down 2-1 at City last month. Managed by former Villarreal, Real Madrid and Malaga coach Manuel Pellegrini, City are second on six points, a point behind leaders Juventus, and will qualify for the last 16 with two games to spare if they beat Sevilla and the Italian champions win at Borussia Moenchengladbach. 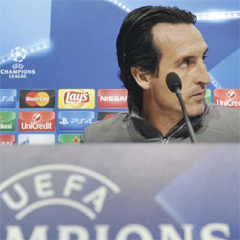 “The Champions League is a very attractive goal but if we don’t feed ourselves every day in La Liga we will go hungry,” Emery told a news conference after the defeat at Villarreal. “I am thinking about what gives us our daily bread and that is the domestic league,” he added. “The Champions League is something to be enjoyed but it is here (in La Liga) that we have to win, that is our reality. “We are not going to win the Champions League, La Liga is what conditions our present and future.” City warmed up for the match at the Sanchez Pizjuan with a 2-1 Premier League success at home to Norwich City on Saturday which kept them top ahead of Arsenal on goal difference.